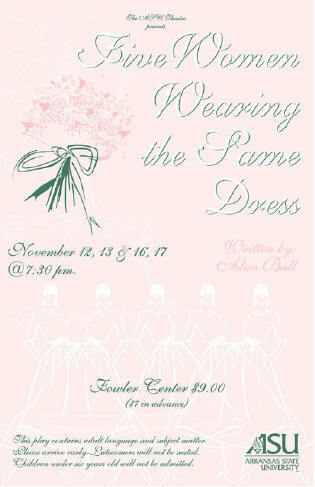 Nov. 11, 2004 -- The Department of Theatre at Arkansas State University in Jonesboro will present the comedy “Five Women Wearing the Same Dress” beginning Friday, Nov. 12, as the second production of the season. The comedy was written by Alan Ball. The production is under the stage direction of Stacy Alley, assistant professor of theatre. Scenic and lighting design will be under the direction of Jeff McLaughlin, assistant professor of theatre. Kelly Schaefer, assistant professor of theatre, will serve as costume designer. Summer Allen, a junior theatre major from Rogers, will serve as stage manager. The cast includes Tonya Rogers, a junior theatre major from Springdale as Frances; Kirby Massey, a freshman theatre major from Jonesboro as Meredith; Ashley Patterson, a senior theatre major from Jonesboro as Tricia; Leslie Goodman, a sophomore theatre major from Jonesboro as Georgeanne; Brooklyn Scalzo, a junior theatre major from Memphis, Tenn., as Mindy; and Dustin Brown, a senior theatre major from Macon, Ark., as Tripp. 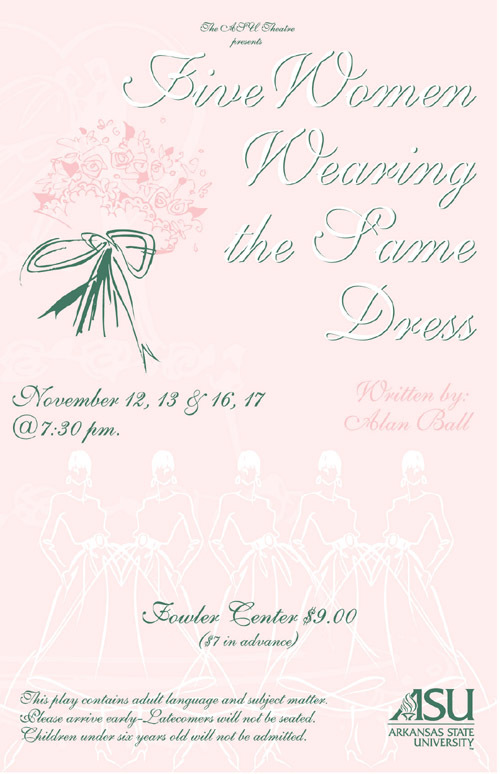 Performances will be at 7:30 p.m. on Friday and Saturday, Nov. 12, and 13, and Tuesday and Wednesday, Nov. 16, and 17, in the Fowler Center. Audience members are invited to join the production company for a post-show dessert reception in the lobby following the Friday, Nov. 12, performance. Tickets may be purchased (for reserved seating, in advance) at the ASU Central Box Office in the Convocation Center or by calling 972-ASU1.Tickets are also available online at tickets.astate.edu. If available, reserved seating tickets may be purchased at the door on the evening of the performance. Ticket prices are $9 at the door and $7 in advance. Advanced reservations are highly recommended. For additional information, please contact the ASU Box Office at 870-972-2781. This play contains adult language and subject matter. Children under six years old will not be admitted.